In the beginning there was only rock – just hard rock. Then it took millions of years to turn into fertile soil which began life on earth and the subsequent long chain of evolution of species on the earth that culminated in the appearance of man on earth. Today when we look back there is enough reason to feel proud of the progress man has achieved. We, at classic constructions take pride for playing our part , however small it be, as a link in the long chain of this progress man has made. Needless to state, the company surges ahead with the unflinching support of its entire work force along with its managers who are committed and dedicated to the core to take up any challenge. 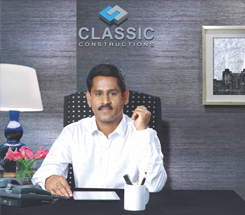 Classic constructions today has arrived center stage among the leading companies in Kerala in the construction arena. This is amply provedby the overwhelming acceptance it has earned over the years from clients of repute across the state. When somebody attempts to make a statement on a company's past achievements, present performance and future strategies, there is every chance that it may turn out to be an over statement or under statement. I am truly caught in such a perplexed situation as I uncap my pen to jot down a few lines for your kind reading. Exercising great amount of caution I shall narrate in as many few words as possible, our story. many others we were also lucky to take advantage of the favourable conditions with our good hard work. Many a prestigious land mark projects were executed to the fullest satisfaction of our esteemed clients. Obviously, we are indebted to our team of committed and dedicated workers along with the foremen and managers for this. I take this opportunity to thank them. Tomorrow belongs to them also if it belongs to us. We look forward to take our company to great heights in the years to come with our renewed pledge to execute challenging tasks with the same commitment to honesty and integrity while registering new standards in quality and speed. Together let us build a balanced world where all of us people and all other living species share the wealth of this world in an equitable manner...!